Help our friend Gus who has been very busy lately attending the clinic in Farmville 2 Roommate Agreement! Quests. He can’t take a break because of the number of patients he has been attending too. We gonna help him find a great place to take a day off and relax in this Farmville 2 Quest. The mission will start this Tuesday (April 2nd). Roommate Agreement! 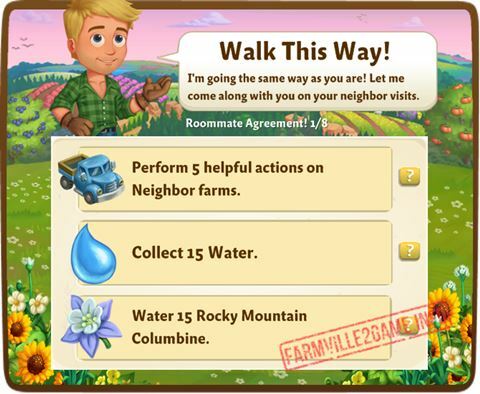 Quests 1: Farmville 2 Walk This Way! Water 15 Rocky Mountain Columbine. Roommate Agreement! 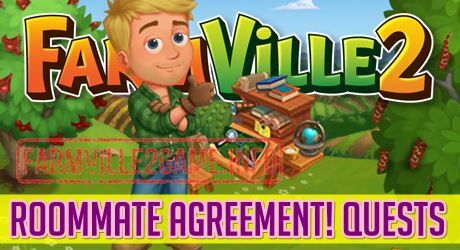 Quests 2: Farmville 2 A Refreshing Change! Roommate Agreement! Quests 3: Farmville 2 What’s Cooking? Feed 4 Adult Mini Horse. Have your sweetie or kid do 1 Pearl Diving job. Roommate Agreement! Quests 4: Farmville 2 A Photographic Memory! Get 5 Leather Photo Album. Make 8 Honey Fig Custard. Roommate Agreement! Quests 5: Farmville 2 Stolemates! Roommate Agreement! Quests 6: Farmville 2 A Dip In Quality! Roommate Agreement! Quests 7: Farmville 2 Got My Thinking Capo-n! Roommate Agreement! Quests 8: Farmville 2 We’re Toast! Tend your Spining Wheel 4 times, our Wool’s top-quality! Make 3 French Toast, because they’re delicious!